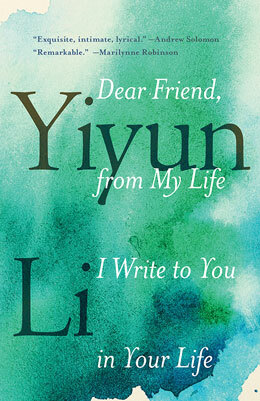 I first found Yiyun Li’s essay collection Dear Friend, from My Life I Write to You in Your Life when researching alumni of the nonfiction program where I work. I knew of Yiyun Li as a fiction writer — with the story collections Gold Boy, Emerald Girl and A Thousand Years of Good Prayers, plus several novels, a MacArthur fellowship, and other writing awards — but didn’t realize she’d written a book of nonfiction. I saw a write-up on the UC Davis website that described Li working on a novel and coming to the realization that she didn’t care anymore — the novel didn’t matter and neither did anything else — which led to the origins of this collection. My impression going into Dear Friend then was that the book was a necessary grappling with depression, an accomplished writer reckoning with crises of faith. I felt a kinship with the imagined book. We were in the midst of an Iowa December, the sky darkening by 4 p.m., winter winds tearing through leggings and coats, and I too wanted to explore that dark territory occupied both by depression and writing, perhaps to see how the two could co-exist, perhaps to understand better how Li had accomplished so much in the first place. This memoir, comprised of essays often told in a fragmentary or associative style, shows a mind at work on the page, zigzagging through time, references, and personal stories. We learn of Li’s two suicide attempts in 2012 and the hospitalizations that followed. We learn of Li’s youth in Beijing, her stint in the Chinese army, and the cruelty with which her mother manipulated Li and her family. We learn of Li’s decisions to move to Iowa, leave the field of science, and adopt English as her “private language” (146), the one in which she can write. We learn, too, of moments when writing has failed her — yet when reading has not. The narrative shape of Dear Friend is not easy to pin down. As Li herself told Paul Laity of the Guardian: “In America especially they like a story in which you become triumphant or overcome a hurdle. But I don’t think I have a narrative arc.” Indeed, this collection isn’t a movement from darkness into light. It doesn’t characterize depression as a one-time foe to be battled and triumphed over, but instead as a force that must be lived with. One might call Dear Friend a search for a rational understanding of depression, or an attempt to navigate a series of existential crises, private reckonings, but that would be too simple. While the book certainly covers a relentlessly bleak time in Li’s recent life — the darkest shadows of the mind refusing to leave — the collection also encompasses more than that. It offers moments of Li’s childhood in Beijing and student-hood in Iowa and portrays fellow writers and mentors in their own states of doubt. It raises questions of familial roles and responsibility to art; considers what Elizabeth Bowen called “the palpable presence of the alternatives” (196) in both fiction and life; and provides considerable literary analysis. This is just a sampling of areas the book explores. Li’s far-ranging curiosity and precision of thought are apparent despite her depression. Li’s exploration of her own cultural identity is a dominant thread throughout Dear Friend. In the essay “To Speak is To Blunder but I Venture,” a version of which appeared in the New Yorker, she discusses her choice to write in English, revealing that she never was a writer in Chinese: “My decision to write in English has also been explained as a flight from my country’s history. But unlike Nabokov, who had been a published Russian writer, I never wrote in Chinese” (141). She describes the Chinese media condemning her choice, fellow countrymen even criticizing her style as a matter of national pride: “You write only simple things in simple English, you should be ashamed of yourself” (142). But Li questions whether she’d be a writer if she hadn’t left China and adopted this other language, one she notes that her mother can’t understand (and in that vein, she does not have her works translated into Chinese). By the essay’s end, Li circles back to the burdens of connection, a continuing thread: “Often I think that writing is a futile effort; so is reading; so is living. Loneliness is the inability to speak with another in one’s private language” (151). So much of the book centers on Li’s confessed desires to disconnect, to erase, to be invisible. Such may feel familiar as the writer’s standpoint. As Li wrote in the New Yorker essay “Listening is Believing” (not included in the book): “I did not yet know that some people were assigned a fate that left them on the sidelines, listening.” Some of the most resonant connections Li explores in Dear Friend are in her reading life — her love of Thomas Hardy, the humor of Kierkegaard. Within the bleakest periods, Li found herself drawn to the journals and letters of renowned deceased writers. She notices the tensions in the Katherine Mansfield-Virginia Woolf friendship, as told in the rivals’ journals, and also finds there moments of recognition, such as Mansfield’s line which became the memoir’s title: “Dear friend, from my life I write to you in your life” (20). The memoir is humming with quotes from other writers. Such thoughts, transmitted across decades — from writers such as Philip Larkin, Elizabeth Bowen, and Marianne Moore — cut through Li’s desolation and reaffirm her role as writer. Li considers, “The books one writes — past, present, and future — are they not trying to say the same thing: Dear friend, from my life I write to you in your life? ” (20). The essay “Reading William Trevor” describes Li’s friendship with the Irish writer William Trevor, from her first tentative letter to him, to their warm conversations over the years when they managed to share meals in the same country. She offers fortifying quotes from their letters—“Stories are a hope, and often they obligingly answer questions” (194) — and mentions his contention that he writes “out of curiosity and bewilderment” (183). Li portrays their friendship with an intimacy that’s a gift to readers. In the Guardian, Laity calls Dear Friend “elusive,” which feels accurate. There is a messiness to the essays and the leaping associations within them, the grappling quality throughout. That Dear Friend didn’t complete the arc, reaching unblemished lightness after the depths of depression, also feels accurate. This is a moving book but not an easy one. Li isn’t trying to neaten her experiences but rather to explore and interrogate them. Her layered insights on writing and literature make the book one I will return to. She writes, “Every time I have a conversation with a book, I benefit from someone’s decision against silence” (134). This reader is grateful that Li made the same choice. Corey Campbell’s fiction has appeared, or is forthcoming, in The Gettysburg Review, Colorado Review, The Rattling Wall, Necessary Fiction, Conte, Anderbo, and The Coachella Review, among other publications. A graduate of Warren Wilson’s MFA Program for Writers, Ms. Campbell lives in Phoenix, AZ, where she’s completing her first collection of short stories.